Every time we travel along Minnesota’s North Shore of Lake Superior, I am reminded of how beautiful it is. 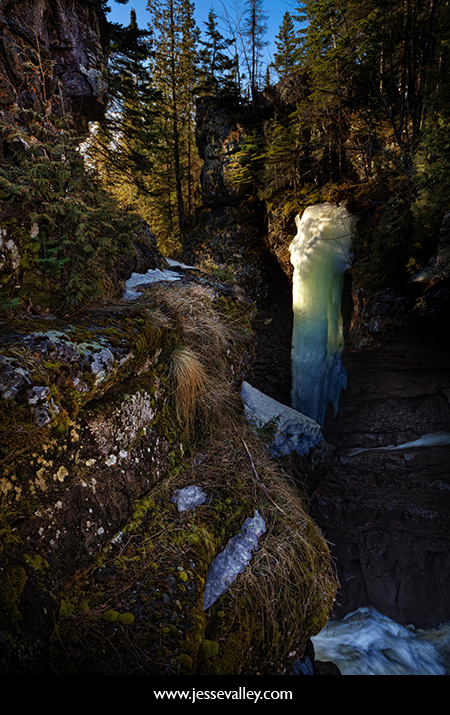 This was our first trip in the Spring, and I really enjoyed photographing the rivers full with snow runoff. It was also very cool to see some remnants of ice from this winter. 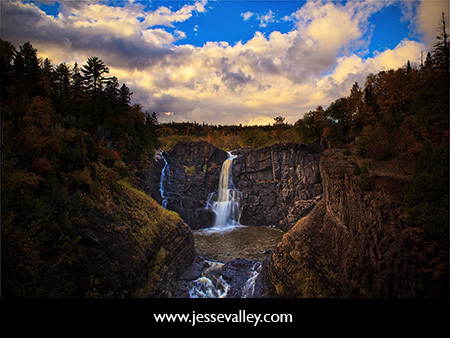 This week’s Fine Art Photo of the Week is an HDR image of part of the gorge that the Temperance River cuts through the earth on its way to Lake Superior. I was struck by the sunlight hitting the icicle as the water rushed in shadow below. Since cameras cannot capture the range of light that our eyes can see, I knew that I would have to take multiple exposures of the scene and combine it in Photoshop to recapture what I saw (7 stops difference between the sun on the icicle and the shadowy water below). Those of you who know me well realize I am not much of a morning person. But the crisp air and beautiful sunrise of the first morning certainly woke me up! We stayed in Tofte, MN, so the Temperance River was close by. The first picture shows a great old tree leaning over the river, and the following pictures are along the shore where the river meets Lake Superior. These last bonus images are of some falls along the Cascade River (top) and of Caribou Falls (middle and bottom). You can’t really see the rainbow that was produced at the bottom of Caribou Falls, so I zoomed in on it for the last picture. 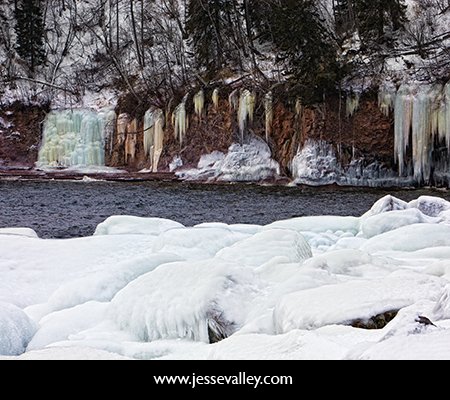 I love to travel and take pictures along Minnesota’s North shore. But I had never been up there in the winter, so I jumped at the chance to take a weekend long retreat and attend a landscape photography class through the U of M Split Rock Arts Program taught by Craig Blacklock. We are so lucky to be on a trip along Minnesota’s North Shore this week, which will end with a wedding that we are photographing at the Glensheen Mansion in Duluth, MN. The fall colors are absolutely beautiful, so I know that there are more pictures that will be worthy to post, but for now I hope you enjoy this image of Pigeon Falls from Grand Portage State Park. This is also the my first high-dynamic range (HDR) photograph. I feel so blessed that there is such natural beauty around the Minneapolis/St. Paul area. 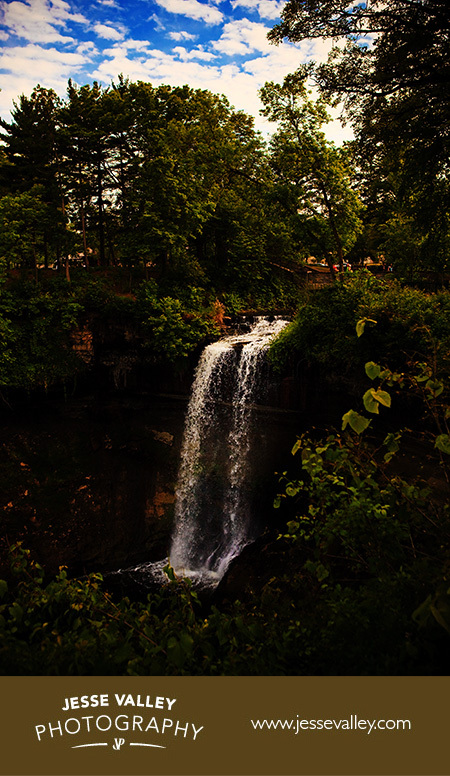 If you get the chance, you should see Minnehaha Falls.